1-2 cups (4-8oz-115-225g) whole nuts of your choice. Mixing nuts is not advisable because each has minor taste differences. water -tape water is not recommended because of the presence of chemical contaminants. Use filtered or spring. Place your nuts a glass bowl, cover with water and leave to soak over night. The softer they are the creamy the outcome. Next morning pour off the water and put the nuts into a blender. Add 2-3 cups of water (475-500ml) of clean water. The best ratio is 1cup of nuts to 2 cups of water. Pulse your blender and then increase the speed and let it run for 1 minute. Let stand for a few minutes then pulse again at full speed for 30 seconds. Pour the liquid through a nut bag or fabric filter over a wide mouthed jug. Thoroughly sqeeze out all the liquid and decant into a clean bottle. Keep in the fridge. 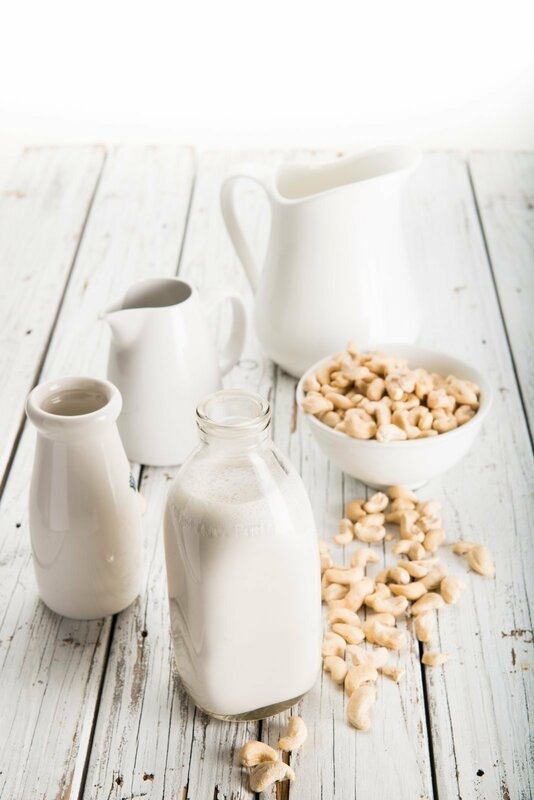 Cashew milk will last up to 7-10 days but almond milk will only last for 3-4 days. I tend to make as required and use within a day or so. The remaining 'nut pulp' can be used to make a 'nut fetta cheese' or the base for a creamy mayo or a raw desert.